Chris first performed with Will-o'-the-Wisp at Cygnet Folk Festival in 2008. Since then, he has been involved at Woodford folk festival, Clockwork Butterfly, Port Fairy and numerous other events. 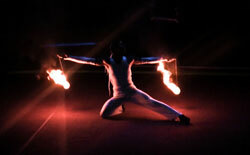 Chris also runs the Australian Fire performance company "Carnival of the Divine Imagination" with whom wisp work very closely. Chris and Eve toured to Vietnam in 2010 with their collaboative show "Elixia" photos can be seen here. In the latest show, Chris performs Poi, staff, double staff, stilts and acrobatics.